Each week will investigate pollinators: bugs, birds, and bats! Where do bugs live? Why do bats stay up at night? We’ll explore wings, light, and all things spring! As we play, flowers will bloom and animals will come out of hibernation. We have new adventures ahead! We will end class each week by reading a related story, having a cool animal experience, or going on a nature walk. An animal experience can mean getting to meet an animal up close or watching some fun enrichment be given out to an animal that lives in the building we’re in that week. The themes are listed on the blog, so check it out to see what else we’ll be exploring this season! What would a nature play program be if it didn’t include a little time IN nature? We’ve all been cooped up all winter and we’re ready for spring! At the Children’s Zoo, we try to set as many stations up outside as we can when the weather allows. We won’t go out when it’s not safe, but we like to take any opportunity to get outside! Occasionally, we will end class with an outdoor nature walk, rain or shine. You’ll see us taking pictures each week on our program camera. We take photos so you don’t have to take as many and can focus on playing with your child. We use these photos on our LEAP blog, so check out the blog each week to see if your child is in the spotlight! We also share all the photos we take throughout the series in May, once class is finished. That's a wrap on winter! Though it may not feel like spring yet, it’s beginning to look like spring outside! Warmer temperatures, the sun shining in the sky and small buds sprouting from the ground indicate the changing seasons. As we transition from winter to spring, we want to share some of our favorite moments getting to know all of you over the past nine weeks. We’ve had so much fun and we hope you have too! It’s been so gratifying and inspiring to see everyone—toddlers, parents, animals, and us, too—grow and change over the past two months. We’ve seen increases in confidence, language, attention span, creativity, and independence across the board. Is your child interested and excited to discover a new material in the sensory bin or a new process art project? Does your child want to explore things he or she didn’t before? Are you seeking sensory experiences outside of LEAP? Is your child using the materials in innovative, creative, and out of the box ways? Does she pretend she’s a veterinarian checking up on the animals? Does he enjoy acting like a chimpanzee and walking around on all fours? Don’t underestimate the value of imaginary play and remember that “make believe” has been shown to strengthen a wide variety of mental abilities. We hope you and your child both got something out of the LEAP experience these past nine weeks and that you are feeling more confident and inspired to make nature play a part of your daily routine. As staff, we know we learn something new every LEAP season! 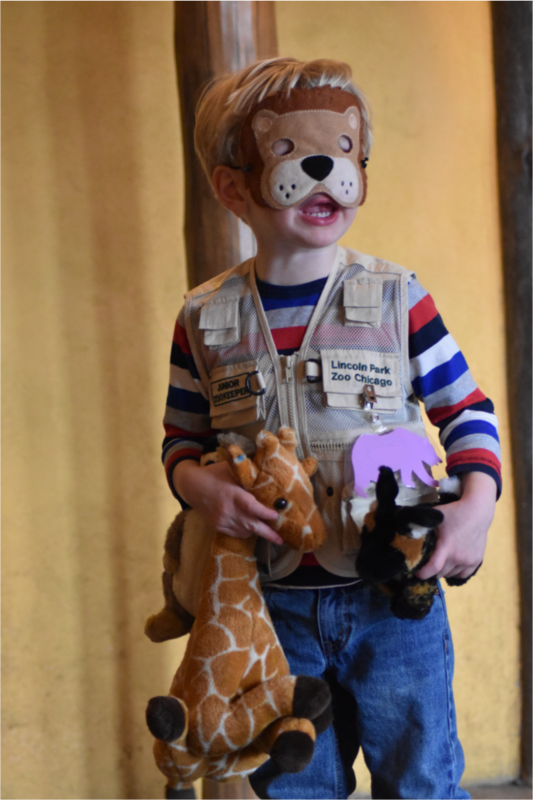 Hopefully we will see you at our Spring session in the Regenstein African Journey and the Pritzker Family Children’s Zoo (hooray for outdoor play!). If you haven’t signed up yet, there’s still time! Click here to register for Spring. Looking forward to seeing you all around the zoo!